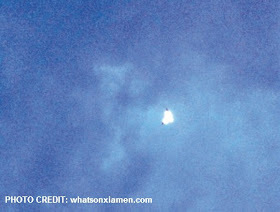 Many Xiamen residents reported seeing an unidentified flying object flying through the sky at high speed on Tuesday evening, according to Wednesday’s Xiamen Economic Daily. A citizen surnamed Wang, who was walking on Dongpu Road at around 19:25 pm, said he saw the rocket-like UFO flying from south to north, blazing changing flames on its tail. "The object flied above the cumulonimbus clouds at a pretty high speed, but there was no noise. At first, I thought it was fireworks, but then I noticed there were color changes on its tail, and its speed was getting faster and faster,” said Mr. Wang. Many posts about the UFO turned up on Sina Weibo, the popular microblogging platform in China, that day, and many netizens in nearby Zhangzhou, Quanzhou, Zhejiang Province and Shanghai also reported seeing something similar. . . .